The confirmation battle for President Trump's Supreme Court nominee Brett Kavanaugh has reached fever pitch in the wake of allegatons against the Judge that he sexually assaulted a woman during a high school gathering. It is the most controversial nomination in almost three decades, drawing comparisons to the 1991 nomination hearings for now-Supreme Court Justice Clarence Thomas, who was confirmed despite the testimony of a former co-worker, attorney Anita Hill, who accused him of sexual harrassment. The stakes were already high for the lifetime appointment to replace retiring Justice Anthony Kennedy, historically the high court's swing vote, and to decide the ideological direction of the Supreme Court of the United States (SCOTUS) for the next several decades. 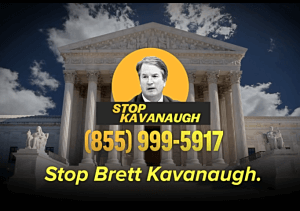 Kavanaugh's refusal to answer questions on key issues during his confirmation hearings before the Senate Judiciary Committee September 4th-7th had already ignited public protest. Most notably were on the issue of a woman's constitutional right to abortion and on questions of executive powers and whether a president can be criminally tried and indicted while in office. The nomination of Kavanaugh, a conservative, was also expected to garner points among Republican voters as the GOP faces massive losses in the November 6th elections due to the policies and actions of an unstable White House under Trump's tenure. Instead, the optics of Republicans rallying around an accused predator amidst the "MeToo" movement, which has empowered women worldwide to raise their voices against sexual and misogynistic attacks, may now further motivate the anticipated "blue wave" at the polls. With a 51-49 Republican majority in the US Senate, it will require the vote of all Democrats, as well as two Republicans, to secure the simple majority of 51 to defeat Kavanaugh's nomination. If there is a tie, Vice President Pence will cast the deciding vote. Senators Susan Collins (R-Maine) and Lisa Murkowski (R-Alaska), who have occasionally sided with Democrats on critical votes, are considered the crucial swing votes in the fight. The end result may hinge on believability. Kavanaugh has already been accused of lying before the Senate Judiciary Committee about his role, when his was an attorney for the George W. Bush administration, in a campaign to put a controversial judge on an appeals court. Professor Christine Blasey Ford, Kavanaugh's accuser, has been invited to testify before the Committee next Monday, September 24th, but has not formally responded. 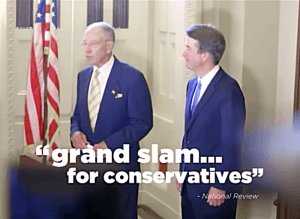 In the interim, independent organizations trying to sway the Senate's vote on the Supreme Court nominee have run more than 16,200 ads -- most heavily in North Dakota, Alaska, West Virginia, Maine and Indiana, home to red-state Democrats or moderate Republicans. The Supreme Courts convenes its next session October 1st.